We've had some beautiful weather lately, and I've been enjoying it from the saddle. The mechaincs have been bouncing off the walls with people excited to buy new bikes or repair old ones, but true to his word, Dan has kept the wait on repairs to 3 (business) days. The newest addition to the shop is the Axiom Typhoon panniers. I used my step-dad's panniers from the 80s to commute to high school, and they were great. I only had two problems: they were not waterproof so I had to double bag my textbooks (and even then they got wet on occasion) and I bounced a bag off the rack a couple times when I hit a pothole. About a month ago, I was riding home from the grocery store with less food than I wanted to buy and more food than I wanted to carry on my back, and I decided it was finally time to invest in panniers of my own. I checked the panniers we carried, and none of them met all of my required criteria: waterproof, high volume, and secure attachment. One, a pannier by Orblieb, had impressed a car-free informant, but their price kept me looking . I checked through all of the bags we could order, and narrowed my options to Delta and Axiom. Both have similar designs, and it's hard to gain any real insight by reading reviews online, so I asked our touring expert Anona. She uses Axiom. I orded Axiom. I was so excited that literally seconds after the bags arrived I was showing them off to a customer who was so impressed that she bought them. We ordered two pairs on the next shipment, and again they were purchased before they even made it to the wall. I kept my pair and carried $73 in groceries in them last week without slipping a disc. Plus, look at the cool things you can do once your bike has a rack (left). We have another pair coming in tomorrow. I suggest you camp out tonight if you want to see them. Seeing people who I recognize from the shop around town reminds me that the shop has a definite presence in the community. I think there are a lot of things we can work on, but it is encouraging. While delivering, I also ran into (not literally) a woman who told me about how she used to ride her bike all the time when she was younger. She lamented that she hasn't had a bike in years and that maybe her "hips are too big", but that she would love to ride a bike around town again. I urged her to try a few bikes out, and that surely there is something that will be comfortable for her. It was a gorgeous sunny spring day, which I think invoked a lot of nostalgia on her part, and she seemed kind of excited at the thought of riding bikes. I hope she comes into the shop. 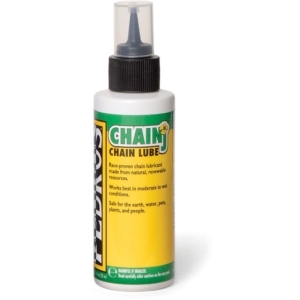 I purchased some Pedro's chain lube and am anxious to try it out! Also, I didn't see the lube in any of the Carbondale bike shops, so I either didn't look hard enough or it hasn't caught on yet. Bike traffic is picking up here as the weather improves (wind and rain are an improvement). Dan and his minions are keeping repairs going smoothly, so we're still scheduling for the day or day after you bring your bike in. New this week: Pedro's chain lube! Chainj and Go! are Pedro's environmentally friendly lubes. We have 4oz consumer sized bottles, and Dan picked up a litre bottle of Chainj for the bench. They're the same price as Finish Line lubes (Go!~Dry and Chainj~Wet), so you're supporting a great company and doing the Earth a favor too. Also, Peter is skiing in Colorado this week, so everything is 75% off (kidding). Champaign Cycle rides into the Blogosphere!